Quality Pest Extermination for Your House - Yes Pest Pros, Inc. Quality Pest Extermination for Your House - Yes Pest Pros, Inc.
A pest free home will always start with something as simple as an evaluation. Pest evaluations are often free and can bring to light any pest issues you think you might have – and sometimes they can bring up issues you didn’t know existed. A lot of people don’t realize they have termites until they see damage – by then the damage can be very extensive. At the same time, an exterminator may check your home inside and out and find nothing wrong and you have nothing to worry about. If there is a problem, they will let you know and then tell you how it can be solved. You can always ask to see what they have discovered and they will be more than happy to show you there problem areas or infestations are. If they see termite tubing, they can show it to you. If they find evidence of silverfish, they’ll point it out and explain it. You will be able to see first hand that pests are living in your home. From there an extermination plan can be drawn up. Before it even starts they will consult you and explain all the steps involved. When it comes to Young Environmental Solutions, we want you to be comfortable with the entire process, from what we use in your home to the methods we employ. Different pests will require different kinds of extermination methods, but each one will be effective and safe for your family and your pets. House pest extermination is something that we do best, whether it’s in Bloomington, Granger, or Elkhart, Indiana. For termites we can lay down additional protection after taking care of the main colony. Spider infestations can give us insight into any other potential pest problems that may lurk in your home. 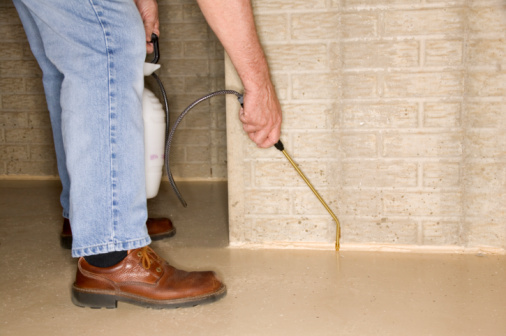 Once the extermination has been performed, you shouldn’t have to worry about the pests any longer. High quality companies strive to provide a home that is 100% clear of the pests involved. If you discover a recurrence, simply contact us. Any time you have any questions about the pests in your home, the products we use, or the methods we have, you can contact us for further information. We strive to be the best in the business and have been family owned since 1983. House pest extermination is something that we pride ourselves on, so you can be sure that you are getting the best of the best when we come to your door.